The work at Faith Baptist Church (now Leiston Baptist Church) was instigated by the resignation of Pastor J.H.Barker from the pastorate at Aldringham. He held the pastorate there from 1911 until 1927. At the time Pastor Barker was living in Leiston, and many wished to see him exercise a continued ministry in the town. Mr Barker stepped out in faith and the Lord honoured it. 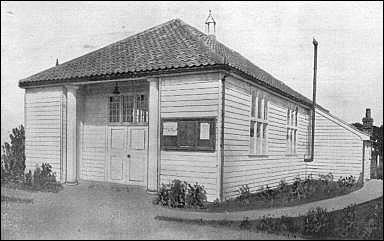 A special meeting was arranged for Tuesday, 18th October 1927, at the Friend’s Meeting House in Leiston. This was to form a “Strict & Particular Baptist Church” in Leiston. The service began at 7pm and Pastor P.Reynolds was the preacher. His sermon was from 2 Timothy 3 verse 15, after which he formally established the Church, who in turn unanimously elected Mr John Hallum Barker as their pastor. Robert Wilson and Thomas Martin were chosen as Deacons. The meeting was then followed by the Lord’s Supper. At the first Church meeting Mr Thomas Masters was elected Church Secretary and Mr Robert Barker, the Pastor’s son, was elected his assistant. Mr Robert Wilson was appointed Church Treasurer. They met for worship on Sunday mornings in Garrett’s Works Hall Committee Rooms, and the Friend’s Meeting House in the evenings. They were very much aware these were only temporary arrangements and that a permanent building must be erected. Mr J.E.Cooper of ‘Field End’ very generously offered a piece of land sized 60′ x 90′ in John Street for the sum of £5, which they gladly accepted. A Building Committee was formed and plans were put into action right away to erect a wooden building suitable for a place of worship. Mr C.H.Lay, FRIBA of Aldeburgh was employed as an architect, and eventually tenders were put out to various builders in the town. The estimate of Messrs. Smyth Bros of Leiston for the sum of £585 was accepted. The builders promised to begin the work without delay and they were quite willing not to press the Church for the money, but to accept it as and when it came in. On Wednesday 14th March 1928 Mrs Guthrie officially opened the chapel. A service and public tea were followed by a public meeting. Pastor G.W.Clarke (Wetherden) came and preached “and excellent sermon”. An organ had been purchased, and Mrs Howes of Hampstead gave a Pulpit Bible together with a carpet for the rostrum. Other useful items were given, as for example offertory bags, a fireproof safe and coal for the winter! At the Church meeting of 30th July 1928 it was agreed to form a Sunday School, with Mrs S.C.Nichols being the first Superintendent. The Pastor’s salary had been discussed several times, and in September it was agreed to pay him 26 shillings weekly from 1st October to 29th February when it would be reviewed. In 1929 the first baptism was held when Brother George Chapman was immersed. In 1930 as there was a shortage of mail members a resolution was passed that until the male membership reached the number of eight, female members would be allowed to speak at Church meetings. Presumably when this total was reached they were to be silent again. There is no indication this actually happened. In June 1931 Brother R.Barker, the Pastor’s son, who had been Assistant Secretary became the new Secretary and Brother Martin became Assistant, thus reversing roles. In April Brother Leach resigned as Choir Master. There had been problems with the choir and the organist, things seeming never to have gone smoothly in that department. The membership stood at approximately 15 or 16 members. It had become a regular feature to hold an evangelistic mission in November each year. On 5th January 1932 a Women’s Meeting was started led by Mrs A.E.Smith. The Church went carol singing in the town every Christmas. The next four years after the opening of the chapel were among the worst that Leiston as an industrial town had experienced, with much unemployment due to the Great Depression. Yet in March 1932 the Church announced they were free from debt, and so on 20th March they held thanksgiving services and heartily sung the Doxology at both services. A Mr Payne of London made a donation to the Church of 25 large Bibles for use in the pews and 10 small hymnbooks for the use of visitors. Despite the depression in 1933 the balance in hand for the year showed the sum of £7, which was remarkable under the circumstances. It as agreed the Pastor should be allowed to hold a mission in December that year, the topic being “The Gospel Ship”. There is no report of how this went. In 1937 Brother Pratt became the new Sunday School Superintendent. For several years there are no minutes recorded. It seems this was due to the outbreak of the Second World War and the Secretary having so much on his hands, until 1942 when he made apologies for not attending these matters. The Church was involved with the ‘United Churches’. This meant meeting on occasions at the Anglican, Methodist and Congregational Churches. This continued for some time. The Church suffered a sad loss in 1943 in the ‘home call’ of Brother Pratt who had been a very valuable member and deacon. The Pastor’s salary had remained the same for some time and the Church was made aware that something must be done in view of the fact the cost of living was rapidly rising. In 1944 there were several American Serviceman stationed nearby attending Faith. Some of them belonged to The First Baptist Church at Welmington, North Carolina. This Church through them made a gift of 78 hymnbooks set to tunes and also made the suggestion that if the Church raised the salary of the Pastor to £2 per week, they in turn would add another £1 per week. This was of great help to the Church. In spite of the heavy snow and bitterly cold weather the members met for their Annual Members Meeting on 2nd March 1946. This proved a very profitable meeting. One of the highlights being the presence of Brother Clarke, who had served for so long in the Armed Forces in the Middle East. On Wednesday, 7th July 1948, Pastor Barker died very suddenly from a heart attack at the age of 72. He had been Pastor for nearly 21 years since the formation of the Church. The chapel was packed for the funeral service on Saturday, 10th July, which was conducted by Pastor W.R.C.Leggett of Stowmarket, assisted by Pastor’s George Reeder of Somersham and H.M.Morling of Aldringham. Later as a memorial to him, electricity was connected to the chapel and a suitably inscribed plaque was fixed to the outside wall. In 1949 the Church joined the Association. From 1950 no minutes are recorded, until 1961 when Brother Martin resigned as Chairman and Brother Harvey was elected in his place. One sad record is that previous to 1961 there had been a vibrant F.O.Y, but by 1961 this had ceased to function. There was a shortage of male members, so the coming of Ben Cook into the town as a police sergeant and joining the Church was a welcome move. It was agreed that all the male members should become deacons, and Brother Cook was elected as the new Chairman of the Church meetings. There were now 15 in membership. However Brother Cook’s time in Leiston was short and on his removal in 1962 Brother Harvey was once more elected Chairman. There was a baptism in 1963. By 1966 a new hall had been built at the rear of the chapel to cater for the Sunday School. The last recorded minute is dated 27th February 1968. The joint meetings that had been going on since 1965 between Faith and the church at Aldringham, resulted in negotiations between them and the Association Executive about closer ties. On 6th July 1972 it was agreed that both churches would unite for worship for six months. The end result of this was that on 1st January 1973 the membership of both Churches was disbanded, and a new Church was formed as Leiston Baptist Church under the pastorate of Pastor Percy Marjoram. Following Pastor Marjoram’s move to take up a pastorate in Ramsey, Cambridgeshire, the church invited Pastor George Hogg to be the pastor. He came to Leiston in 1978 from the church at Wetherden having previously been a pastor and evangelist in London. He and his wife ministered in the town until their retirement in 1982. During this time the afternoon services closed at Aldringham Baptist Chapel and the building was subsequently sold. One ministry they introduced was a monthly Songs of Praise at Charles Miller Court (a sheltered housing scheme) which continues today. In 1983 the church took a step of faith and invited Peter Jackson, the church secretary, to become its full time pastor. Peter and Patsy ministered faithfully in Leiston for 28 years until their retirement in 2011. The building was extended and updated following the sale of the Mission Hall in Kings Road. Peter had a particular burden for door-to-door evangelism and visited every home in an expanding Leiston at least four times. Outreach activities included the Garrett Club for ex-employees of the local engineering works where Peter had worked himself, Sunday School and Bible Class, week night Discoverers Club and MAYHEM for young people, a mums and toddler group and a regular men’s breakfast event. The church website was also established. Following Pastor Jackson’s retirement the church had a two year interregnum until October 2013 when Tim Crowhurst was appointed as pastor for a probationary two year period, this appointment being made permanent in October 2015. ‘Soup and Sweet’ lunches, Men’s Breakfasts and youth activities have continued and newer outreaches such as ‘Cuppa and Company’, children’s activities on the park and an outreach Quiz Evening have commenced. In 2016 a new wall was built in front of the church and car parking space made beside the church facilitating flat and easy access into the building for everyone. In October 2017 the church celebrated her 90th anniversary with a special service and meal. The guest speaker was Richard Underwood. The beginning of 2018 has seen a new kitchen fitted to help in the catering activities. We continue to welcome visitors and holidaymakers. Full details of our past, present and future activities can be read in our Annual Church Report.